While we might well be waste collection experts here at Skip It – our average customer certainly isn’t. And that’s fair enough, you’ve got a whole lot more important things to worry about then your rubbish, which is presumably why you’re here. Not everybody’s going to immediately know which waste collection services are right for them. With house clearance services, this can often be particularly true. 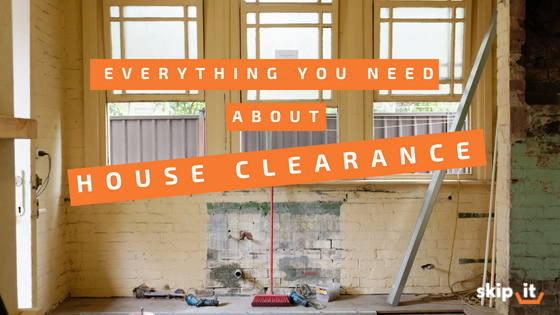 So if you’re wondering what exactly a house clearance is, and whether it’s the right choice for you, then you’ve certainly come to the right place. Here’s everything you need to know about house clearance services. What are house clearance services? House clearance services are best for large scale clear-outs. We’re not talking about a small amount of rubbish that can build up in a skip over time, or even a bulk of waste clearance that you can get rid of in one go with a wait and load. If you’re looking to give your house an overhaul and need to get rid of permanent fixtures or bulky items like furniture or appliances, then you’re in the right place. Unlike with other waste clearance services like skip hire, you don’t have to worry about any part of the process, other than telling us what you need taking and when you want it doing. That’s right, our friendly waste collection specialists will be here to remove the relevant furniture from your house – and will turn up within a guaranteed two-hour window. After that, we load all items into our van and responsibly disposed of via a licensed waste disposal site or recycling operation. Getting everything done in one easy-to-organise, self-contained session is one of the benefits of getting a house clearance team in. As well as this, we’ll also give your place a clean sweep afterwards and make sure it’s looking good as new. What kinds of household waste can you dispose of? We’re happy to take pretty much any kind of furniture, and a range of other household items. As long as it fits in our van, we’ll have you covered. This includes carpets, furniture, tiles, kitchen appliances, cupboards, carpets and even rubble. In particular, we specialise in kitchen and bathroom fixtures, and have a range of specialist equipment needed to remove heavy items from the loft right at the top of your house. Other than liquid waste products like petrol, diesel and oil – we’ll take absolutely anything. It’s worth noting that particularly large items like mattresses, fridge freezers and tyres are liable to a slight surcharge on top of the price. Click here for tips on how to minimise the price of your house clearance services. If you think that house clearance services are what you need – then get in touch with us today. Simply fill out our enquiry form, telling us how much waste you have and when you’d like it collected, and we’ll give you an approximate quote. Book your house clearance services here today. Has China’s Ban on Rubbish Imports Affected UK Waste Clearance?